Larabars are my all-time favorite type of granola bars. First of all, they’re absolutely delicious and they come in tempting flavors like blueberry muffin, carrot cake, chocolate chip brownie, and apple pie. Second, they’re each made up of fruit & nuts (and sometimes cocoa powder/chocolate chips, depending on the flavor)– and that’s it! No weird, unpronounceable ingredients. My favorite flavor, apple pie, has just 6 ingredients: dates, almonds, walnuts, dried apples, raisins, and cinnamon. And, as I discovered recently, they’re really easy to make yourself. The ingredients go for a quick whir in the food processor, which chops up the nuts and turns the dates & raisins into a paste that’ll hold the bars together. When the fruit and nut mixture comes together after a few minutes, you just press it into a baking pan, cut it into bars, and your homemade Apple Pie Larabars are ready to eat! 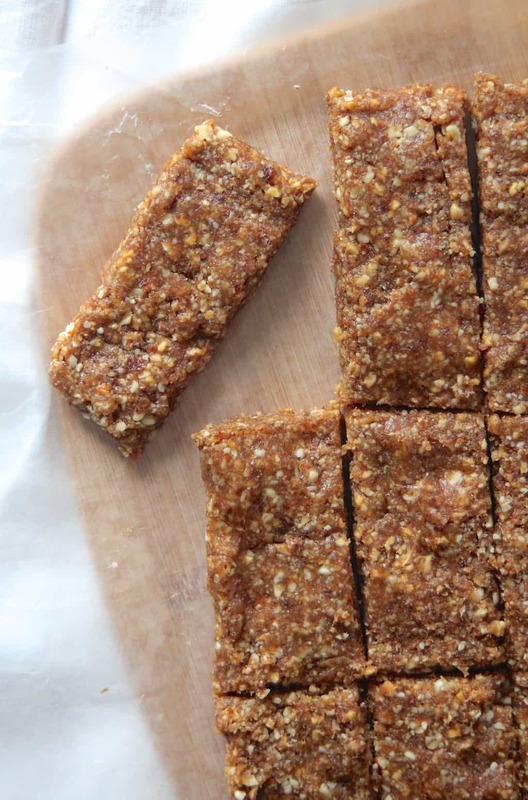 It turns out that, like most things, Larabars taste even better when you make them yourself– not to mention, you can make them for a fraction of the cost that you can buy them. And if you happen to have any special food needs, these are a perfect vegan, gluten-free, soy-free. and dairy-free snack. Yessssss! 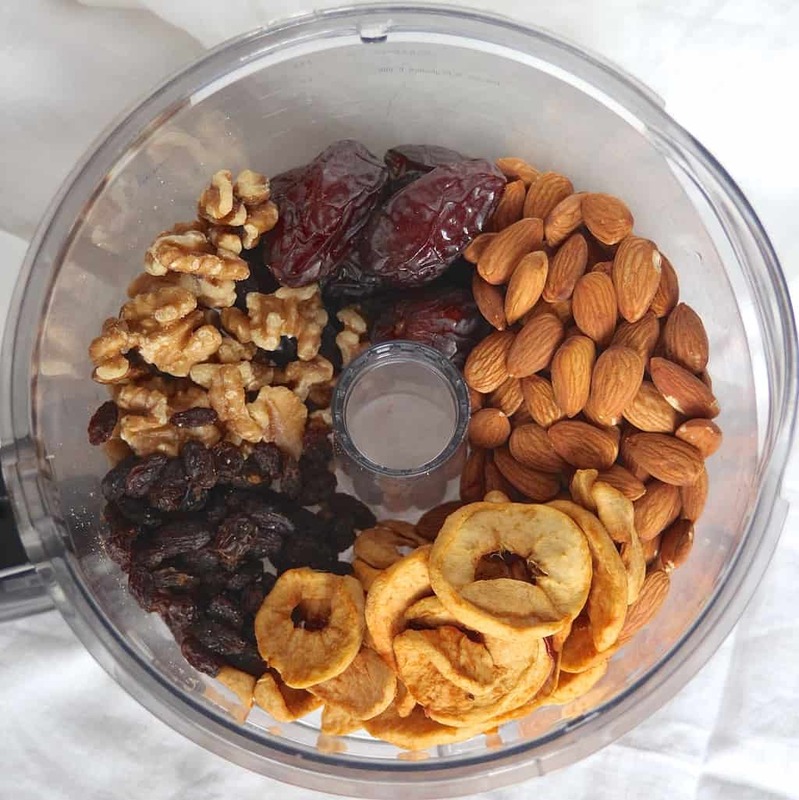 Place all the ingredients in the food processor, with the dried fruit on the bottom, and blend until the fruit & nut mixture is finely chopped and sticking together. Line an 8x8 or 9x9 inch baking dish with wax paper, with extra hanging out around the sides to cover the mixture. Pour the mixture into the dish and cover with the extra wax paper. Press or roll the mixture out until it's smooth. Lift the wax paper out of the pan and cut the fruit & nut mixture into 10 equal bars. Wrap individually in wax paper or plastic wrap or enjoy right away. Store in pantry for up to 3 months or refrigerator/freezer for up to 6 months. *Be sure to use Medjool dates and not another variety such as Deglet Noor dates, since the stickiness of the Medjool dates is what holds the bars together. *If your raisins and dates seem dry, soak them in a cup of warm water for 5 minutes before using. So glad I found this recipe, I was looking for a paleo option for a bake sale I’m hosting this weekend! Awesome! These would be a perfect Paleo-friendly treat 🙂 Yay!! How fun that you make them, too! As long as you have a food processor, they come together in no time at all! I love Larabars too and so does my family. I can’t wait to try making this homemade version! 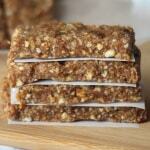 I admit to buying bars on occasion, but totally agree with you that homemade Larabars taste so much better! I haven’t tried making apple ones yet – great idea! Wow! Yours look so perfect and exactly like the actual bar haha! I really need to get myself a food processor… all i have is a magic bullet and i’m worried the dates will get stuck in the blender! YES, I’m glad you think they look authentic! Hmmm, I can see how that’d be a problem with the Magic Bullet. My food processor was such a worthwhile investment since I use it all the time! They look so good! Thanks for posting – these could make a really good healthy treat 🙂 Have a great weekend girl! Hope you have a great weekend, too, Ashleigh!! I have only had a few a larabars in my lifetime, but I remember loving them! Although I did not like the blueberry muffin flavor, which seems to be an unpopular opinion. I have heard amazing things about the apple pie flavor! I need to get my hands on one! Your recipe looks delicious! I love that you are in college yet still finding ways to pull off such delicious recipes! I confess that I made & photographed these when I was at home a while back since I don’t have a food processor at school 😉 But I have a couple recipes coming up soon that I’ve made in my dorm room! I am definitely going to try this recipe! 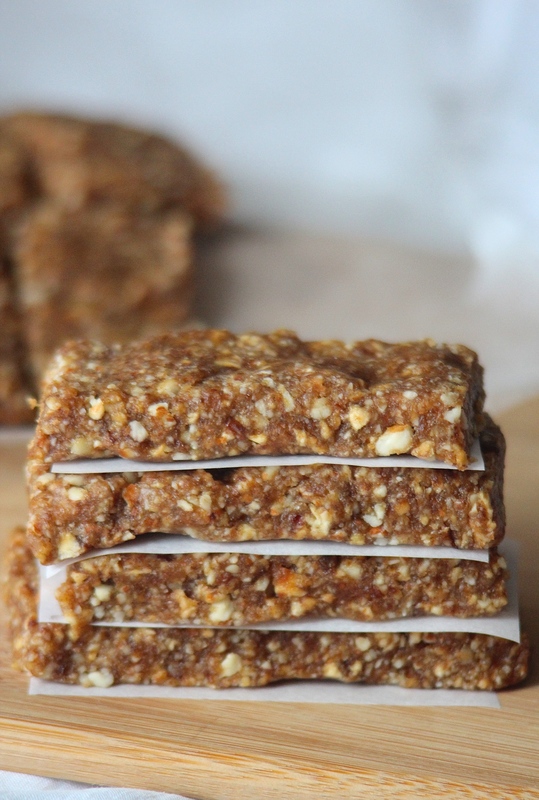 I’m so guilty of buying processed bars lately instead of trying to make something at home. I’m too lazy to play around with the recipe, so thanks for posting this! Hey Ashley! Aw bummer 🙁 I use my food processor so much that I think it’s been a good investment! I use it for grating cheese for homemade mac ‘n’ cheese, making bars, shredding veggies, and probably lots of other things 🙂 But it’s obviously not a must-have, except for the occasional recipes like this 🙂 Hope you have a great weekend, too! YUM! I love Larabars especially the cherry pie. It’s got sour cherries in it and reminds me of cherry cobbler…without the pits! You can pretty much customize any bar like this adding chocolate or seeds as long as you keep the ratio or nuts to dried fruit at 1:1 Thanks for sharing! These sound and look absolutely amazing! I’ve never tried the apple pie flavor of Larabars, but I bet yours taste much better anyway! I’m all about my no-bake energizing snacks – these would be a great thing to keep on hand and the fact that they taste like pie? Can’t go wrong with that! I love no-bake snacks! So easy 🙂 The only downside of making them myself is that I’ve been going through them way too fast! Yes! It was a fun mini kitchen project and I’ll definitely make them again whenever I have time. Isn’t it so fun to make things that you’d typically buy instead? Liv again with these recipes!!! This looks delicious!! I added this to my pinterest food board to remind me to make. I’m excited! Hi Liv! Happy start to a new week. These apple pie larabar’s look like a great protein bar to give you that energy boost you need pre workout or during the afternoon slump. Thanks for sharing this protein packed recipe! I’ve been loving Larabars during those afternoon slumps when I just need a little energy boost 🙂 Hope your week’s off to a great start, Jessie! I love making homemade Larabars! I like Apple Pie, but I think Banana Bread is my favorite. I’m an RA and live in the dorms so no kitchen for me, but I did whip up a batch of bars the last time I was home. I love to eat them straight from the freezer – in fact I think they taste best like this! I’ll be reunited with my food processor over Spring Break soon and will have to give your Apple Pie version a try! Ahh so awesome that you’re an RA!!! I’m actually going to be an RA next year, so no kitchen for me this year or next year. I haven’t tried the Banana Bread flavor yet, but oh wow, that sounds amazing! Do you have the recipe on your blog? No, I don’t – at least not yet! I sort of just threw the batch together and didn’t measure things, but I am planning to test recipes next week over break and hope to have it up soon! That’s awesome that you are going to be an RA! This is my second year and the role is definitely hard work, but so rewarding and is a great experience. These look so yummy and simple to make. Perfect for on the go snack and little energy boost when things just get too busy :). Hi Misty! I haven’t tried it, but I don’t think fresh apples would work because they have a lot more moisture than dried apples. Can’t wait to try these! Just wondering how do you store them if you’re not going to eat them right away? Hi, Erin! I typically wrap each bar individually in a small piece of plastic wrap. You could also put each one in a small sandwich bag. I recommend storing each one individually so they don’t stick together. Hope you enjoy! This recipe is PERFECTION! Quick, easy, and spot-on! YAAAAAAASSSSS!